In 1994 we began a business which made more than a few folks raise an eyebrow. It started with purchasing my first ever boar which grew to be massive and who was known as “Walter” shortly thereafter we bought a dozen wild sows and began raising more. 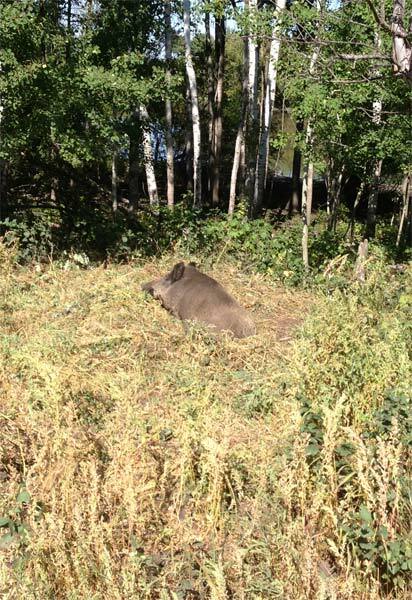 “Walter” turned mean, not to us, but to other boars and began killing his own offspring, at that point we moved him into a very bushy quarter of land to live with some other boars. A young bow hunter working road construction nearby expressed interest in hunting the boars with his bow and so we invited him in. 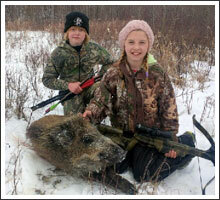 That hunt was thrilling both for us and the three young hunters that came to hunt. 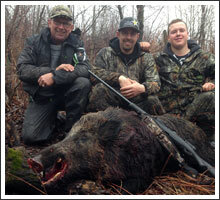 They harvested three boars over the course of three days, one with a muzzleloader, one with a crossbow and one with a compound bow. 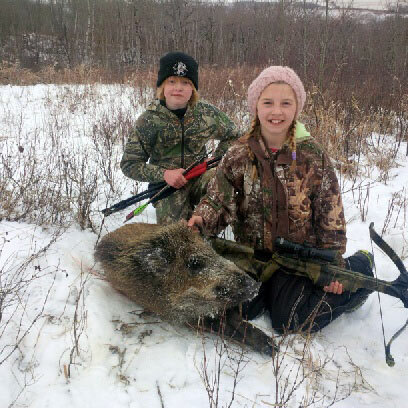 Although there were lots of boars and the hunters were not novices (harvesting a bull moose with the bow the previous fall) the boars seemed to be able to evade us with little difficulty. 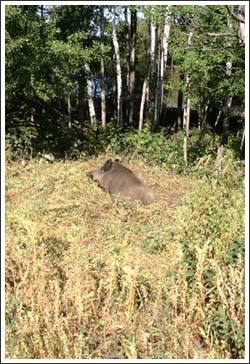 We worked hard for every one of those boars and developed a whole new appreciation and respect for them. 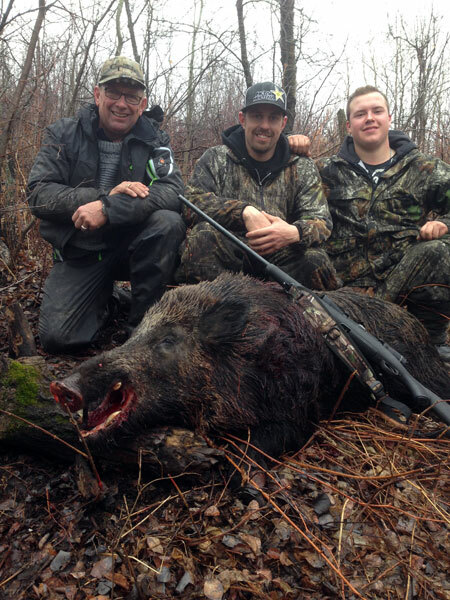 Since then we have hosted hundreds of wild boar hunts and every time I see the excitement in the eyes of the hunters I know what they are feeling, and I think back to that first hunt over 20 years ago. I’ve been a big game guide for a number of years and decided with a growing family of four boys, it was time to try to stay home with my wife and raise our family. 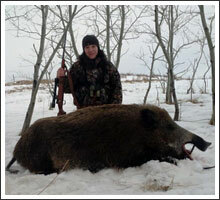 As a family we have always enjoyed and appreciated the outdoors, hunting, fishing and camping etc. that coupled with a guiding/outfitting background and professional cook training as well as my wife’s business/accounting skills we decided to try and make a go of a small family owned outfitting operation right here at home. Since we raised our own boars and the market could not be relied on in the early years we choose to make our own market. 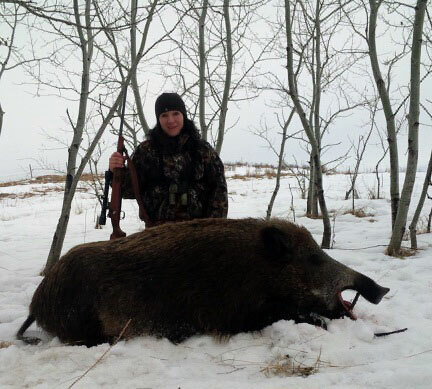 Hunters come to us and we allow them to hunt our boars on our property, enjoying the large rolling hills, valleys and beauty of the landscape.